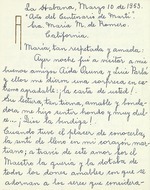 ﻿ Letter to María Mantilla de Romero from Amelia Oscamendi, March 10, 1953, regarding her letter to the Perlas. Letter to María Mantilla de Romero from Amelia Oscamendi, March 10, 1953, regarding her letter to the Perlas. ~~~~, ~~1 mtoR4nsz /S6~mo~ e93. -Ia; ce e*tYL, ,te. 9nc-~~ L .
~. a-~ )4. P& ArL wo0 . & Lu m, ._ Hto v ho.